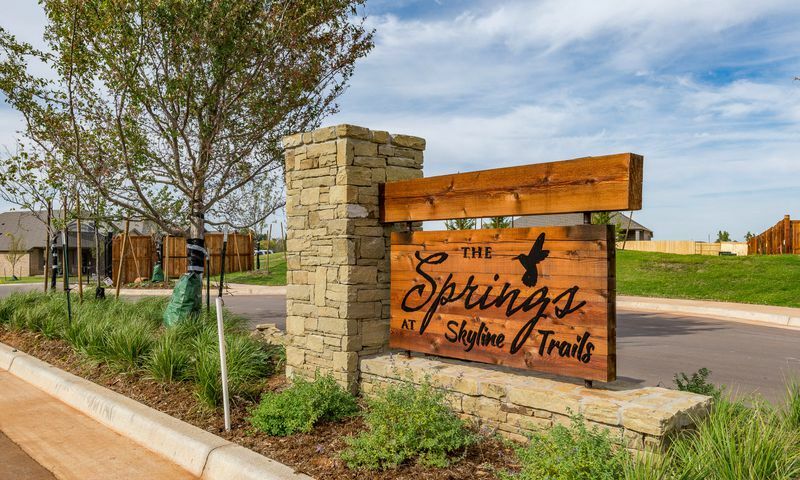 The Springs at Skyline Trails is a gated community located in Yukon, Oklahoma. Developed by Landmark Fine Homes, The Springs at Skyline Trails features eight floor plans that range from 1,567 to 2,093 square feet. Each home includes three bedrooms, two bathrooms, and an attached two-car garage. Each home is designed to incorporate open living spaces, allowing for low-maintenance as well as a focus for entertaining friends and neighbors. Central to the community is the clubhouse, where residents can come together to socialize and partake in social events and monthly gatherings. Features of the clubhouse include a fitness center for staying in shape, as well as an outdoor pool located just outside. Here, residents can sit back and enjoy the beautiful Oklahoma summer. A beautiful pond and walking trail can also be found in the community. Located in Yukon, Oklahoma, residents of The Springs at Skyline Trails have an assortment of shops, restaurants, and entertainment venues nearby. Less than 15 minutes away is the Outlet Shoppes at Oklahoma City, which features over 90 shops, including Carter's, Michael Kors, and Gap. Thirty minutes away is one of Oklahoma's most populous cities, Oklahoma City, which has a wide range of sights to check out, including the Oklahoma City National Memorial & Museum, the Crystal Bridge Tropical Conservatory, and also Cattlemen's Steakhouse, a popular eatery recognized as the city's oldest continuously operated restaurant. A great location and close-knit atmosphere make The Springs at Skyview Trails a worthwhile community to explore in the Oklahoma City-area. Check back soon for more information on the lifestyle in The Springs at Skyline Trails. 55places.com is not affiliated with the developer(s) or homeowners association of The Springs at Skyline Trails. The information you submit is distributed to a 55places.com Partner Agent, who is a licensed real estate agent. The information regarding The Springs at Skyline Trails has not been verified or approved by the developer or homeowners association. Please verify all information prior to purchasing. 55places.com is not responsible for any errors regarding the information displayed on this website.